Last month I talked about how colours when used in a grey tonal paint should relate to each other. If you use a high key colour, unless you are deliberately planning something really different, it would mean high key colour does not relate to all the other colours in the painting. 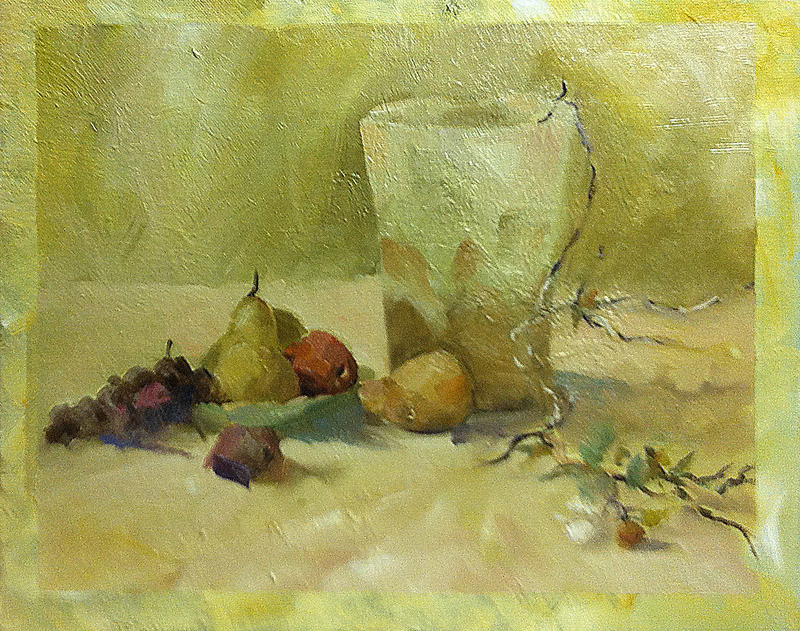 For example, if you wish to put a red or pure yellow (EG: Cadmium Red or Cadmium Yellow) object in to a grey tonal painting, you would “knock back” or reduce the intensity of the red with green and the yellow with purple (complementary colours) so that they suit or relate to the rest of the painting. How much of these complimentary colours you add will affect the resulting colour, so in many cases a tiny dab goes a long way. When mixing for a mid or grey tonal painting, how many colours can you mix together to get that mid tone? Well, a lot. It can start at as many as five and go to seven or nine. remember, you are knocking back colours to get a soft, looking through the mist effect. Just imagine you have a light fog, or the gala of sunlight as you may see it through a window, creating that effect of blurring items. These types of paintings rely on the colours harmonising with each other. That doesn’t mean there is no contrast, it means that you use it wisely and sparingly to help create depth and edges. David still wants me to push my use of colour and mixing further, but it is improving. This is involved process and takes time to learn to mix paints with confidence. My thoughts are to not give up and to not be afraid of experimenting with your palette to see what you can create. The only failure is being afraid to fail. Today’s model was a familiar face from my time at Chisholm during the past three years. Craig has modelling for life drawing classes and I have also drawn his portrait in the past. The task today was to work on his curly ginger hair, fair complexion and more mature facial features. As artists we may underestimate the value we may have to galleries and the National Trust in Victoria. I think we all need to have a think about how much we really know and how much we can offer. Even if you act as a guide, preparing for an event or even helping to keep a beautiful National Trust building clean, your knowledge about how to take care of art, your care and meticulous work practices can be of service. There is also the advantage of often learning more about art history, the care and archiving of art and antiques that comes with these volunteer positions. This doesn’t take into account the new network of people you will be engaging with and new friends you may make. Many artists work alone in their studios and need to get out and mix with other artists and the public. Exposure to other types of art, talking to people and learning about our arts heritage is a great addition to the knowledge base of any artist. I can highly recommend volunteering. It can bring you new skills, be great fun and may lead your career in a new direction that you may not have initially thought of. If you live near a regional or local gallery or National Trust building why not get in touch either in person or via phone or email and ask how you may contribute? I am now studying full time for a Bachelor of Fine Art and Visual Culture (double major) on line, so am making sure that I can keep my volunteer work going and even more have signed up for something a bit different to my McClelland Gallery Educational workshops by applying to Mulberry Hill which is very close to where I live. This National Trust home has a huge arts background which I am keen to learn about and be involved with. By volunteering there I network more with the local arts scene and artists as well as “paying it forward” by helping out. Mulberry Hill is renowned as the home of Sir Daryl and Lady Joan Lindsay. Designed by Harold Desbrowe Annear, this magnificent American Colonial style-home was built in 1926 as an extension to a pre-existing 1880s weatherboard cottage. Sir Daryl Lindsay was the Director of the National Gallery of Victoria from 1941-1956, and was knighted for his services to Australian Art in 1957. In addition, he was an accomplished artist, and assisted in founding the National Trust of Australia (Victoria) in 1956, being its inaugural president for seven years. Lady Joan Lindsay is most recognised for her novel, “Picnic at Hanging Rock,” and wrote several publications, as well as being an artist. Lady Lindsay’s autobiographical text, “Time without Clocks,” is a reminiscent text detailing the Lindsay’s lives together with wonderful descriptions of Mulberry Hill and social commentary about the arts and social history of the time. The house and its contents, a collection of Australian art, Georgian furniture and glassware, and Staffordshire ceramics, was bequeathed to the National Trust by Sir Daryl and Lady Joan Lindsay. The 2014 Survey is now on at the Gallery and open to the public. Whilst volunteering you may be a guide through this huge arrangement of sculptures from established and well known artists, or may have the opportunity to show a school group some of your favourites from the Survey. There is also the opportunity to work in art workshops for kids which are always fun. Volunteers also learn new skills and can look in at the current exhibitions in the gallery building as well as attend artist talks. Mulberry Hill and McClelland Gallery are always on the lookout for new volunteers so give it some thought if you can spare some time in your week. Their web addresses are below for contacting them.